We’ve discussed salt and sodium intake already on a few occasions and we covered topics like salt cravings and also took a skeptical take on sea salt compared to more common table salt. Our conclusions are that more often than not salt has been falsely accused, that it’s a very healthy nutrient and also that sea salt is often over-hyped and that table salt is just as good. Now, lets have a look at salt from a different perspective: cooking with it. Most health food stores now have a whole section dedicated to salt, so it’s only natural that things get overwhelming and that making a choice gets doubting. 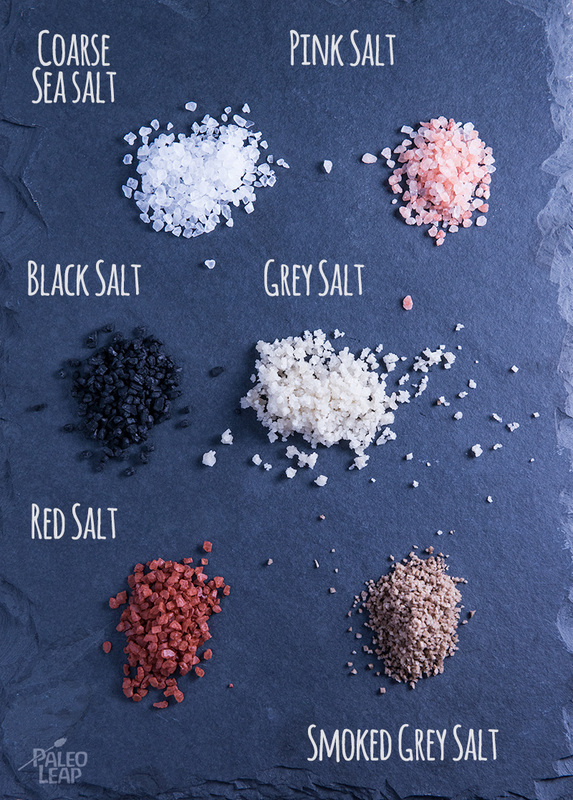 Now, salt is salt and the fanciest of salts won’t have that much more to offer nutritionally, but sometimes it’s nice to get creative with flavors and textures and specialty salts also make for a great gift idea. A most popular option in health food circles, sea salt is now readily available everywhere. It gets its name from the fact that it was harvested from the sea. It can be used as an all-purpose salt and it’s available coarse or fine-grained. Kosher salt is another good all-purpose salt. It dissolves rapidly and has a coarse texture, which makes it a good option to cure meats. Morton is a popular brand. Pink salt, also often known as Himalayan pink salt, is the most popular of the colored salts. It can be used in place of table or sea salt and it gives a slightly crunchy texture to dishes. Pink salt also often contains trace minerals. Grey salt is a moist salt that’s most often hand harvested in coastal regions of France. It takes its grey tint from the clay found where it’s harvested. This one is often a little more expensive, but it adds a nice touch to finished dishes and salads. What sets flake salt apart is its texture, being flakes instead of the more usual crystals. Maldon is a popular brand and it can be used anywhere regular sea salt would be used. Iodized salt is now what’s most available in grocery stores. Iodine is an essential trace element to life and iodine deficiency was once a huge problem in the western world until manufacturers started to add iodine to salt. It’s cheap and perfect as a all-purpose salt. We often see people frowning upon this commercial salt because its a refined salt that lacks trace elements, but it doesn’t have to be avoided at all. On the contrary, it can be a great way to get much needed iodine in your diet. Table salt is often the same thing as iodized salt, being refined, devoid of trace elements. Most table salts have iodine added to them and some contain additives to prevent moisture absorption. Fleur de sel is hand-harvested along the coast of France. It’s a fancier salt with a higher price tag, but it can be a great gift idea. Use it as a finishing salt for dishes and enjoy the crunchy texture. Smoked salt is a sea salt that has been smoked over wood fires. It’s also more expensive and has no extra nutritional benefits, it’s a salt that’s enjoyed more for the extra smoky flavor that it adds to dishes. All kinds of flavored salts are available commercially or can be prepared at home. Garlic, lemon, chile, vanilla and lavender are popular flavors. Red salt is an Hawaiian sea salt. It gets its color from a mineral known as Alaea. It’s the traditional salt used for the Hawaiian Kalua pig preparation and is also great on fish and seafood. 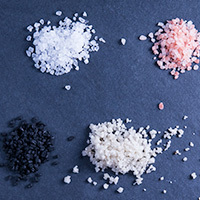 Another salt originating most often from Hawaii, black salt get its color from the charcoal that’s been added. Enjoy it on eggs, fresh salads, seafood and fish. Apart from Hawaiian black salt, a different black salt, originating from India, is another form of black salt that’s available.